ANDREA CUOMO is Executive Vice President, Advanced Systems Technology (AST) and Special Projects, and has held this position since January 2012. He also serves as Chairman of the Board at 3Sun, ST’s photovoltaic joint venture with Enel Green Power and Sharp. Cuomo joined SGS Microelettronica, a predecessor company to STMicroelectronics, in 1983, and rose to become Vice President for the Headquarters Region in 1994. In 1998, he created the AST group, a key organization in the development of ST’s system knowledge and advanced architectures. In 2002, Cuomo was promoted to Corporate Vice President and AST General Manager, and took on further responsibilities as Chief Strategy Officer in 2005. In 2008, Cuomo was appointed Executive Vice President, General Manager of Sales and Marketing for Europe and AST and his portfolio was later expanded to include the Middle East and Africa. 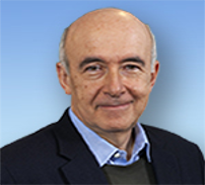 His board memberships include the International Advisory Board at the HEC Business School in Paris, the International Advisory Board of Nano-Tera, a Swiss National program for Nanotechnologies, and TTFactor, the IP utilization arm of the Istituto Europeo di Oncologia.